The original Albacores. 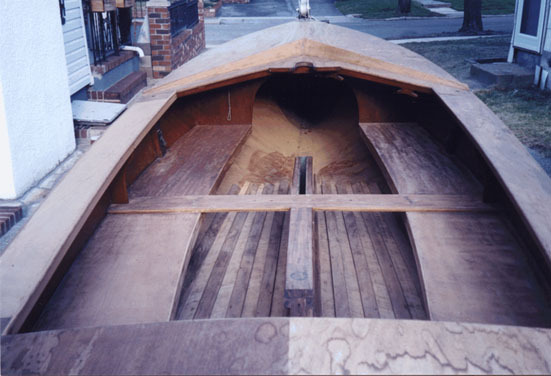 Hot molded construction- 3 ply mahogany hulls (there are a reports of a few experimental boats made with 2 ply and 4 ply construction). Outer ply diagonal to waterline. Stern deck extends 20 inches forward of transom. Fitted with rotating masts- aluminum with Sitka spruce tapered tip. Full width centerboard slots originally fit with steel centerboard (˜60 lbs). About 75 boats shipped to North America. Original shipment to Hyannisport, MA in 1957: #260-275. 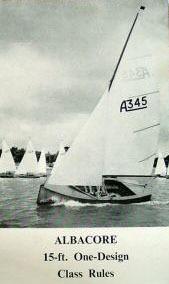 A few older boats were also shipped to Toronto, Canada for use in the junior training program at RCYC. Hull/Sail numbers can be identified on brass plates affixed to carlin under stern deck or on centerboard case. Mk 1 boats also had a production serial number (about 1/2 inch in height) embossed on the inside of the transom. This number does NOT correspond to the sail number assigned to the boat, but Peter Duncan does have a list that can be used to identify the sail number if the production number is know. In original form these boats had open bench seats. Air bags were secured under seats for additional buoyancy to aid in self-rescue. 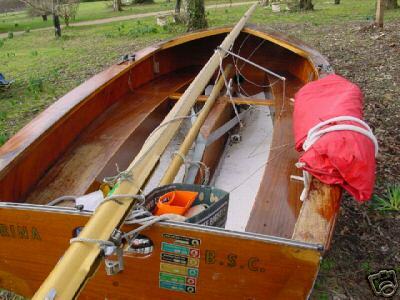 In the UK many of these boats were sold as kits for owners to finish to their preferences (#652) is an example of a kit boat. This resulted in considerable variation in the fit out details. In addition many of these older Faireys have been modernized with new decks, sealed tank seats, wood centerboards of near full thickness and aerofoil section, and all aluminum rigs. Hot molded construction- 3 ply mahogany. Outer ply parallel to waterline. . Cockpit built with open bench seats These boats were built on a second set of molds that were built to replace the original molds destroyed in a fire at Fairey Marine in the1960's. Other than the change in the planning orientation, these boats were very similar to Mk 1 boats. Canadian builder McGruer and Clark (see below) imported partially complete hulls carrying sail number 700-716 from England. These boats, except for #716, were fit out with narrow (1/2 inch) centerboard trunks (for metal centerboards), had four (rather than 2) external bilge keels and no internal floorboards. A layer of fiberglass was laminated on the entire inside of the hull. Most of these boats were delivered to Muskoka, Ontario and few have survived as the fiberglass tended to trap moisture in the hull plys and accelerate dry rot. (Note there are also fiberglass boats built by Grampion and Whitby that with numbers that duplicate those built by Fairey Marine).